The next most important element when choosing a gun besides a gun itself is of course, the holster needed. If you plan to conceal carry, you need a holster in order to help with drawing the firearm, shooting it, and also to prevent accidental discharge. But what is the best-concealed carry holster for you to use? Well, read on and learn about our top picks for this. Why do you Need a Concealed Carry holster? You need a concealed carry holder in order to carry a gun in a safe manner. Concealed carry holsters help with protecting the firearm by holding it into a safe place, prevent accidental discharge, allows for quick access. Since you only have milliseconds to act in a situation like that, and also prevent theft or loss, since you’ll be carrying it on you at all times. A good holster is very important, since it needs to fit the gun in an accurate manner, and in a way that’s comfortable for you. It also protects the firearm, prevents discharge, and also provides quick access and stops theft in its tracks. You should with your holster, be able to holster your gun and draw easily, and you should practice this in order to master this. The factors to consider when choosing a gun include many different aspects, and we’ll touch n them here. Total trigger coverage: You need to make sure that your holster completely holds the gun in, but allows you to access the gun trigger in order to draw during tan encounter. you also want material that is sturdy. Kydex for example is a great holster because they’re made to last. You don’t want it falling apart and then accidentally firing and potentially hurting someone. Retention: This is how well the gun stays put. If you turn it upside down, does it fall out? If it comes out, you need to adjust the retention, or get a different holster. A good holster is one that’s discreet that won’t be seen by the average public eye. Unless your state allows open carry, you will need to use a concealed means to carry the firearms. How it protects the handgun: Your holster needs to protect the gun as well. Some of the harder materials cause marks on the finish of guns, and stiff holsters can affect the state of your gun too. How it protects the body: In a similar vein, a holster that’s stiff and uncomfortable is going to rub and chafe the skin, and it won’t be fun to hold onto. Some holsters can even rub so much against your clothing that it can cause holes in your clothes, which is never fun. Finally there is grip. If your holster doesn’t give you the ability to have a full grip on your gun, you need a better holster. You need a high grip, so that you can deactivate the safety and shoot one-handed if needed. Your holster should give you the option to fire from any position, and I suggest a position where you can reach with your weak hand too. There are popular holster types that matter in the grand scheme of conceal carrying, and understanding the nuances of each one is important. The different types of holsters determine how you’ll carry your concealed carry. IWB: Inside the waistband, which goes into your underwear and pants and help to keep the gun close to your body. They also don’t print as much. OWB: Over the waistband, which is when it rests on the outside of the pants, anchored by the belt, but they might attach differently. it’s less concealable and tends to print a bit more, but it’s also comfortable because there isn’t something poking you. Belly Band: These literally go around your belly, and are like a belt. You need one that covers the trigger, and as of note, it can get a little bit sweaty when wearing it. Shoulder holsters: Ones that wrap around the shoulder, and they hold the gun on the supper side’s rib area. It doesn’t squeeze and is stable, but it is more likely to fall off, and probably not the best for concealing because once you take off your jacket, it will be printing obviously. Ankle: This is a method which is great if you want to conceal in a deeper manner, or for when you need a backup means. The only way this will print, is if you’re wearing pants that are tight and nobody will know that you’re holding onto a gun unless you show them. 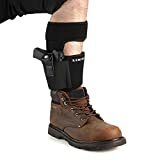 However, every method has their drawbacks, since the gun can be hard to access, and it can be uncomfortable to the level where you can feel it chafing your skin unless you wrap it against a boot or some high socks. All of these holsters have their pros and cons, and honestly, the best way to decide whether or not you should invest in one holster or not is based on the comfort and type of carrying you’d like to do. If you prefer carrying against your waist then do that. If you want to carry on your shoulders, you can as well. The waist holsters and the belly band holsters tend to be the ideal means of carry, but how you choose to carry your gun is ultimately up to you and what you feel personally is easy for you. This is probably our best pick because of the versatility, and the comfort that this has. Belly bands are your top pick usually due to the comfort and the fact that they’re versatile, with the one drawback being you might get a bit sweaty when you have this on. But, this one holds clips and buttons, along with straps to keep your holster firmly against your pants. It has a quick strap that is right over the grip of the gun, allowing for a faster release, and in essence you just pull the trigger, and then draw in the event of an emergency. Every pistol you need, so if yo opt for a smaller carry due to a tighter shirt, this won’t be an issue. It also works for semi autos, compact and full size handguns, revolvers, and pistols. It’s pretty nice, and it allows you to hold your gun pretty easily. If you want an award-winning holster, then look no further. it’s an IWB holster that’s made with a neoprene back to it in order to enhance the comfort. The retention can be custom made for any type of model and gun that you plan to carry, and it allows you to choose the right draw right away. The best part is, you don’t need to factor in the break-in time either. Once you take it out of the box, it’s worth it. Plus, for the price that it is, it’s certainly worth it. It has a lifetime warranty, and it’s also waterproof too, so you don’t need to worry about it getting loose due to sweat. It also includes a ride height, retention and cant that are all adjustable to help you house your gun. If you’re smaller, this is a really good one, since it conceals for skinny people well. It doesn’t move around either, so you won’t have to worry about that. The one downside is that it may be a little hard to get on a belt, and the clicks could be a bit stronger, but for the price you’re paying, it’s a great, affordable holster. This is our second pick, and it’s a top-quality holster for an amazing price, with a smooth draw, easy re-holstering, and is made of super strong material, and even has adjustable retention. It is made from boltaron, which is a study material, and you won’t have to worry about friction with this holster. It is made with a sturdy and wide belt clip, but the holster itself is slim enough that your gun will be concealed pretty well. It’s also lightweight, so for carriers that don’t want to weighed down by the way that their gun sits on their body, this is the best option. The one downside is that if you do draw, it tends to move the holster, so you probably won’t be able to move it back until it’s over. 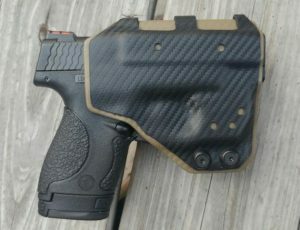 if you’re looking to ankle carry, which has the benefit of super easy concealment, this is a great one. The retention is great, and the extra calf strap keeps it in place no matter what your activity levels are. It’s also got a comfortable design that feels great, which is what sets it apart from other holsters out there. It is made of neoprene material, which makes it soft, so you won’t have to worry about it chafing the skin. There is also a foam pad that goes beyond the barrel area of the holster, which means that it won’t pinch, poke, nor will it rub the wearer in ways that they don’t want to be hurt. The best part, is this one fits a wide range of guns, so if you don’t want to buy a ton of holsters, this is a great option, and it comes with a lifetime warranty, meaning that it will last a lifetime, and you don’t need to worry about it breaking down either. This is our fifth pick due to the unique design. It feature a unique type of speed cut design that allows for you to draw smoothly, and easily re-holster this. It has an auto lock system which is a little different from the others, but it allows for your handgun to be securely fastened against your body, and it can be positioned to help with facilitating the drawing system. 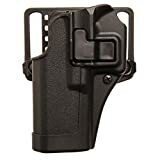 It features a full grip reinforcement, and the audible lock that you hear when you re-holster is great for this, and it comes with belt loops with platforms that paddle as well. it’s got an adjustable cant, and it fits pretty well. it’s also quite durable compared to other models out there too, and for its price, it’s worth it. The belt clip is hard to get on and off, and compared to these others, it’s a little bit bulkier. 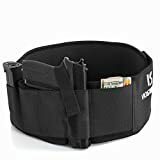 Plus, the clothes can get caught on this when you re-holster, so if you plan to wear bigger shirts that are bulkier, this may no be the ideal option for you to use. 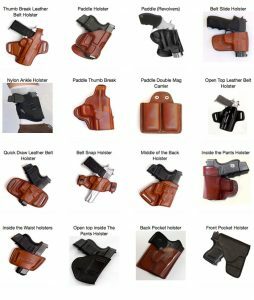 When you look at all of the holsters out there, you have to remember that this is a decision based on your own personal preferences, especially with how you want to carry. There are many options, and finding the correct one is important, since you’ll want to carry this every single day. If you’re not comfortable with the holster, you wont’ want to cary it. When choosing a concealed carry, always have your own preferences in mind, and choose an option that best fits your personal tastes as well.